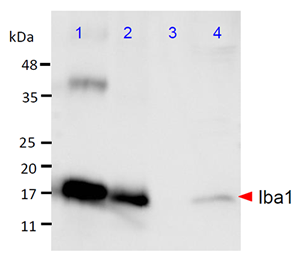 Iba1 is a calcium-binding protein with a molecular weight of 17,000 specifically expressed in macrophage/microglia. Recently, microglia has attracted attentions because neurological damage effect by production of NO, TNF-α, and IL-1β have been proved in addition to its role in neurotrophic effects/neuroprotective actions. 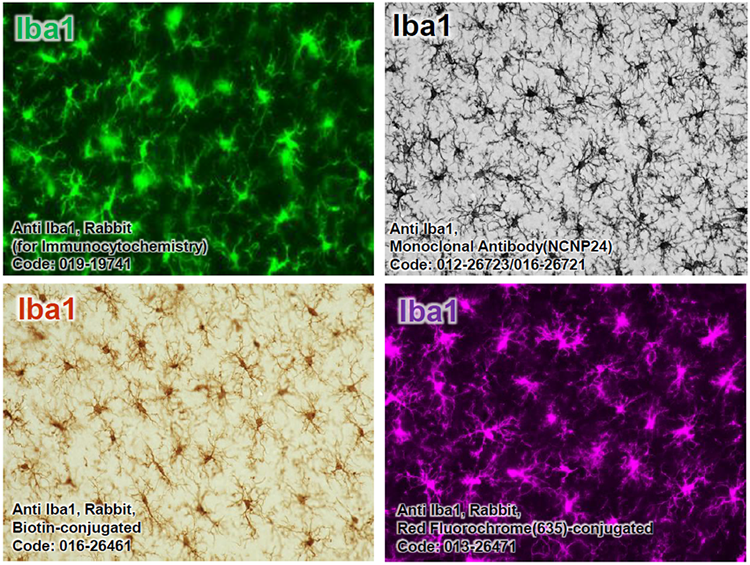 These products are antibodies that specifically recognize Iba1, and are available for a microglial marker. 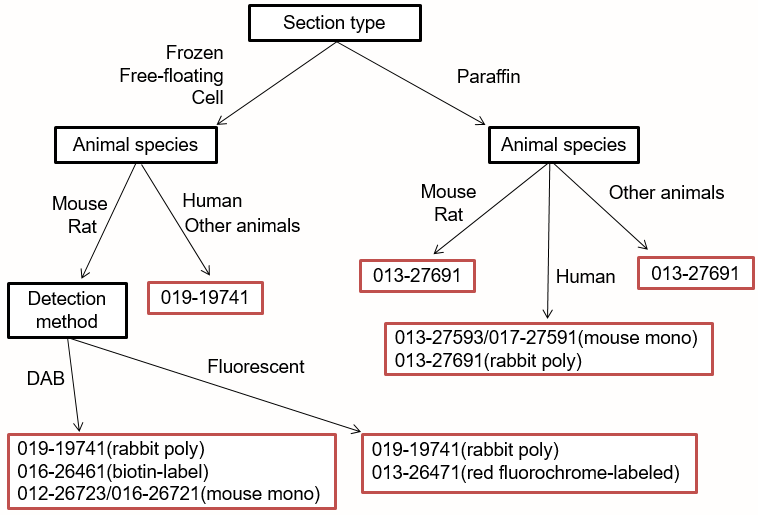 In particular, "Anti Iba1, Rabbit (for immunocytochemistry) Code No. 019-19741" is used by many worldwide researchers as a standard for microglial marker antibody. There are also many references in major journals such as Nature, Cell etc. Search with google scholar with the keyword "Iba1 019-19741 Wako"
For detailed literature information, please refer to HERE. These data were provided by Sanagi,T., Manabe,T., Ichinohe, N., and Kohsaka, S., National Center of Neurology and Psychiatry in Japan. The data was provided by Sanagi,T., Ichinohe, N., and Kohsaka, S., National Center of Neurology and Psychiatry in Japan. Ahn, J.H., et al. : Lab. Anim. Res., 28, 3, 165 (2012). Ide, T., et al. : J. Vet. Med .Sci., 72, 1, 99 (2010). Gaige, S., et al. : Neurotoxicology., 34, 135(2013). Rodriguez-Callejas, J.D. et al. : Front. Aging Neurosci., 8, 315(2016). Fantin, A., et al. : Blood, 116, 5, 829 (2010). Jones, M. E., et al. : Brain Behav. Immun., 67, 355(2018). Sun, J.S. et al. : Mol. Med. Rep., 12, 2, 2677(2015). Grishchuk, Y., et al. : Am. J. Pathol., 186, 1, 199(2016). Wan, S., et al. : J. Neuroinflammation, 15, 31(2018). Chen, Y., et al. : Annals of Clinical and Translational Neurology,10.1002/acn3.513 (2017).